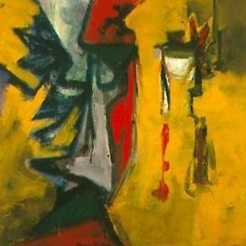 Elmer Bischoff grew up in Berkeley, California, the second-generation Californian son of a father of German descent and a mother of mixed Swedish-Ecuadoran origin. He entered the University of California, Berkeley in September 1934, completing his master's degree in May 1939, and immediately started teaching art at a Sacramento High School (1939-1941). During his years at university, one teacher had influenced him most: the highly independent-minded Margaret Peterson, whose total dedication to her teaching, and insistence on the ethical value of art, were to have a great impact on the artist Elmer Bischoff would be. In 1941, he served as a lieutenant colonel in intelligence services in England during World War II and was stationed near Oxford. He returned to the US in November 1945. After the War, back in San Francisco, Bischoff found himself once more in the midst of avant-garde artistic ebullience - mixing, among other painters (and to name but two), with such artists as Mark Rothko and Clyfford Still. In January 1946, a golden opportunity was offered him: one of his artist friends, Karl Kasten, suggested Bischoff as art teacher for a position still available, at San Francisco's California School of Fine Arts. 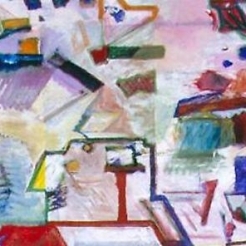 It was then that Bischoff entered a faculty which already included some of the most talented new artists of post-war America, including David Park and Richard Diebenkorn. 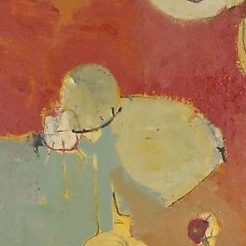 While distinct from expressionist art that came from Europe, art of the Bay Area Figurative Movement displays the immediacy and warmth that one sees in abstract expressionist painting.